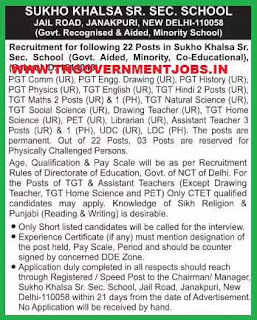 Applications are invited for PG Teachers, Drawing Teacher, TG Teachers, Librarian, UDC, LDC and Physical Education Teacher Posts in Sukho Khala Senior Secondary School. 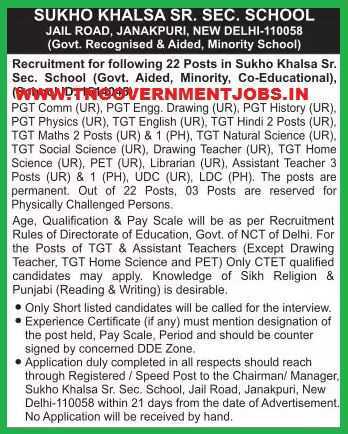 Hiring Organisation : Sukho Khala Senior Secondary School, New Delhi. Salary ranges : As per Govt of Delhi NCT is applicable. Interested and eligible candidates are requested to apply with detailed application form with supported documents to the following address with in 21 days from the date publication of the official notification.